Take the train to visit Colorado and the Rockies. Amtrak’s California Zephyr leaves from Chicago at 2 pm and arrives at Granby station the next morning. 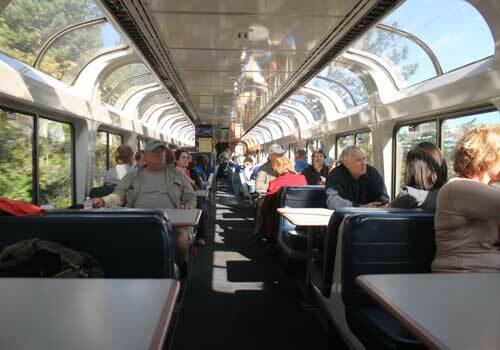 Noted as one of the most scenic train rides in North America, the Zephyr then continues through Colorado and ends its journey outside of San Francisco about 36 hours later. 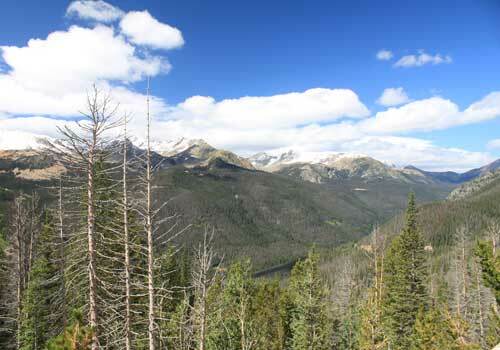 For families that want to visit Denver, Grand Lake, Rocky Mountain National Park, Fraser and Winter Park, the train is an adventurous and enjoyable mode of transport that can also be affordable. The train ride from Chicago to Granby Colorado is mostly done at night. The sun begins peeps over the horizon shortly after the train enters Colorado. We’d spent the early morning hours in the sightseeing car taking in spectacular scenery as the train carved a path through the Rocky Mountains. This is the start of one of the most scenic rail journeys in the world. As the train began the mountain ascent, a cluster of skyscrapers in a misty pile appeared on the horizon. That was Denver. Such a big city dwarfed by a mammoth landscape. The two and a half hour ride from Denver to Granby is best viewed from the right side of the train (Engineers side). In that stretch, the amazing views of canyons, tunnels, giant rocks pushing through the brown landscape, pointed fir and pine trees, and the faded blue line on the horizon hinting of even bigger mountains in the distance is sometimes stunning. Every passenger, whether traveling in coach or first class, has the option of moving to the sightseeing car. This car, like all the others, is two stories with a lounge (snack bar) on the bottom level and tables, benches and swivel/lounge chairs on the second floor. The second floor has floor to ceiling windows so the views of the outside are expansive. People can sit and talk freely as they take in the views landscape rushing past. The lounge car is noisy and full of activity. Fiction writers should all ride the sightseeing car for character research. This is the ultimate people watching opportunity. Amish families (there’s always an Amish family) on vacation, Europeans discussing the American landscape, couples cuddling in the booths, 20-somethings with laptops and iPods, the occasional child with nose pressed against the window… all are part of the sightseeing car environment. I was amazed at how many people opted to stay in their coach seats or first class roomettes when the sightseeing car was a choice. Why view such a spectacular landscape from one small window, when you could sit more comfortably, move more freely and see so much more in the sightseeing car? It’s a great environment for writers. There’s a plug for the laptop at every table, and it’s just as easy to keep to oneself as it is to meet friends and learn something new. There are over 30 tunnels that the train goes through in this part of the Rockies. Most were constructed in 1904 and were done without heavy equipment. The Moffat is the most famous as it is 6.2 miles long and takes the train about 15 minutes to pass through. Before the Moffat tunnel was an option, trains took a route over the mountains which was 30 miles long and took 2 1/2 hours. The ride from Denver to Granby takes about two and half hours. The California Zephyr pulled into the station in Granby, Colorado at 10:37 am. Once in Granby, the real drama comes into view. The Rockies with their white caps (in September – so last year’s snow) are stunning. The views of the landscape are anything but subtle. Angles of pointed pines and jagged mountains, with carved out valleys set against the bluest skies, are stark and magnificent. One almost can’t take it in. Granby is the stop Amtrak denotes for Rocky Mountain National Park. It’s a small town next to another small town, Grand Lake. The western entrance to the park is close and it’s less traveled by hoard of tourists. We rented a car with Avalanche Car Rentals and the service exceeded our expectations. They met us at the station with the car, did a quick transaction, and met us there again when we were ready to leave. Prices were affordable and they were extremely accommodating. We spent two days in the Grand Lake / Granby region and now I wished we’d spent more. Coming by train and renting a car is super convenient. There’s just so much to see in the park and around town. Hi Mindie. I’m researching options for a trip to Colorado I’m taking with a girlfriend in a few weeks. I was wondering if I could ask you some questions about the train ride from Denver to Granby? Perhaps I could e-mail you or call.